The devastating Humboldt Broncos bus crash on April 6, 2018 deeply affected the hockey community and beyond, including several NHL players who stepped up to help out the survivors, families of the victims and the Saskatchewan community. Dell, who plays goalie for the San Jose Sharks, and his father, Phil, have formed a special bond with one of the Humboldt hockey players who survived the crash. Straschnitzki, paralyzed from the chest down, is from their hometown of Airdrie, Alberta. Phil, who has been in the home improvement business for years, and the people of Airdrie worked together to make the Straschnitzki home accessible. 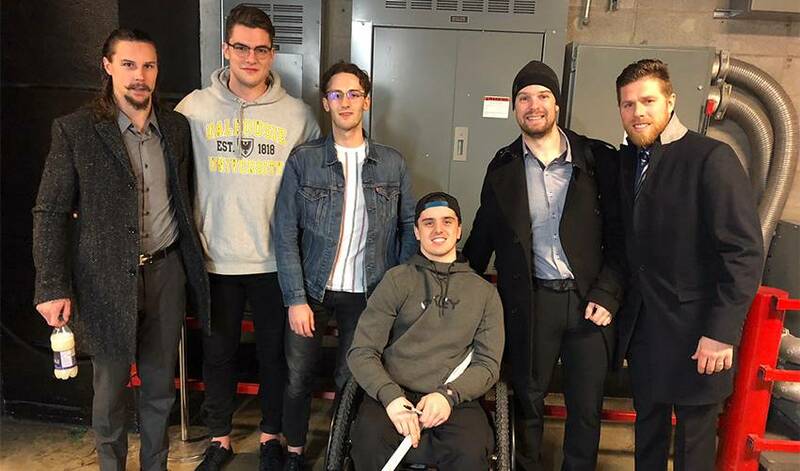 Aaron, who has raised money through auctioning off autographed San Jose memorabilia, recently brought the 19-year-old to a Sharks game in Calgary. Aaron wasn’t quite sure what he’d say or how uncomfortable the conversation might be when he first met the teenager. Straschnitzki quickly put the backstopper at ease. Aaron often uses the term “life-changing” when he speaks of his newfound friendship with Straschnitzki. Whenever the pair has a chance to talk, hockey often dominates the conversation. For Aaron, the experience has been a reminder of how tight-knit the hockey community is. And support is what Aaron and Phil Dell will continue to offer Straschnitzki and his family.